Welcome to The Fitness Focus blog! You need to get the fundamentals of weight loss right. As wonderful as it would be to have a miracle pill to help you lose 20 lbs overnight, there simply isn’t one. Real change on the inside and out takes time. Imagine for a second, no more yo-yo dieting, no more dragging yourself to the gym, no more starting again next week. I challenge you to start today. Because for every second you wait, it is time you’ll never get back. Here are the 5 tried and true simple steps to follow to start your own transformation today that have helped thousands of just like you. When I first started blogging about my own health and fitness journey, I had no idea how many women and men would come to build this community. It is the incredible people I’ve met, become friends with, helped along and continue to support who continue to make this journey an amazing one. Do you want to get more involved in The Fitness Focus community? There are many ways to stay connected. Join The Fitness Focus community Facebook page. Prefer email? Subscribe to The Fitness Focus email newsletter for new post alerts and reader only content like my 7-Day Fresh Start Weight Loss Plan. I lost 30+ pounds only to gain it all back again and then some(keep reading to see pics). And throughout my life, I have yo-yo dieted and tried almost every fad diet there is. My problem? You can’t just diet and exercise and then go back to old habits. If you do, you end up right back where you were. By finally changing my habits, I’ve been able to maintain my current weight for 5+ years. This includes losing every ounce of baby weight less than six months postpartum. Forget about the latest fad diet. Forget about dieting. You do not need to diet! What works for a lifetime is simple: eat a well-balanced diet of real, healthy, unprocessed foods. Food is not the enemy. Lots of diets have you cutting out food groups. What this does is cut the amount of calories you eat and helps you lose weight. But how realistic are these type of diets? I know if there is chocolate cake at a birthday party, I’m going to enjoy some – and you should, too! Portion control. I don’t believe in food group elimination for long-term success, but this doesn’t mean you can’t experiment with different diets. Think balance without over consumption. Understand the 3 key macronutrients. A quick overview here. Protein = muscle building and tissue recovery. Carbohydrates = source of energy. Healthy Fat = body functions. We need them all! Eat real food (most of the time.) Hey, I’m a realist. I eat donuts, I have the occasional fast food burger, I even eat cream-filled cupcakes sometimes. But real whole unprocessed foods make up the majority of my diet(80%+), and so should yours. Our bodies cannot run efficiently when we feed it processed, sugary and overly salted foods. I believe for long lasting weight loss and maintenance results, you need to be eating the right amount of calories (portion control) with the correct percentage of calories coming from your basic food groups. With that said, I do see benefit in experimenting with different diets and how they work for your lifestyle. Just be sure to remember the basic points above. Do you have to work out to lose weight? Simply said, no. Weight loss is caused by the body operating in a calorie deficit over an extended period of time. Working out (especially cardiovascular exercise) increases calorie burn, which can increase your calorie deficit. This results in much faster fat loss. The body: Exercise helps with weight loss, increases muscle, increases bone density, increases strength and flexibility, and helps keep your heart healthy. The mind: Exercise may reduce anxiety and depression levels, helps you sleep better, increases energy, and increases level of confidence. There are so many great resources online and offline. Offline, you can go to the gym and even hire a personal trainer who can help you develop and execute an exercise program. Personally, I’ve had success with the gym – when I was in shape. However, getting in shape and staying in shape was a whole other beast. That is how I started my journey with at-home workouts. If you don’t like paying a monthly gym fee, feel intimidated at the gym or are not a fan of locker rooms, you’re in luck. There are so many resources we have access to, including streaming workouts online. I practice what I preach, which is why I recommend Beachbody workouts for at-home training. Admittedly, I was probably a little too low in body fat with this after picture. PS. I actually weigh more in the after picture than I normally also. Beachbody (once you get past the silly name) workouts programs like P90X, Insanity, 21 Day Fix, PiYo, T25, Shift Shop are how I train and keep fit. I’ve completed many programs that are reviewed on this blog. Now with the latest Beachbody on Demand (BOD), it’s a whole lot easier to bring these top programs into your home. BOD allows you to not just stream these effective programs, but also gives you digital access to all of the program materials. As for cost, there is the All Access Pass for $99/year, or you can try out the entire service with a free account. Aren’t feeling comfortable enough for a workout program just yet? Start out with a 10-minute walk or two each day. Week by week, increase your walking time or distance walking. This is a great exercise to begin with. Just get moving and you will get better! If this is your first time here, it’s most likely that you want to get in shape. You may want to lose weight, gain muscle, or tone up. Whatever your reasons are, if you do not follow the upcoming guidelines, you will likely be searching the Internet in a week or two in another attempt at losing weight. It’s been proven that humans need goals. I have them, top levels athletes have them, and CEOs of Fortune 500 companies have them. Here is why you must have them, too. It’s a brain thing. To put it simply, making progress towards and reaching our goals actually releases feel good chemicals in our brains that keep our momentum strong. This helps us to stick with it longer and not give up. Wondering how to set goals for yourself? Specific: What exactly is it that you want to accomplish? Relevant: We are talking about your health and fitness goals here, but you could set SMART goals for all areas of your life. Time Bound: Put an exact date on when your goal will be accomplished. If nothing else, write them down! Then read your goal daily. The idea is to look at your goal every morning to ensure the actions you take every day turn into habits that will help you reach your goal. Bonus Tip: Attach a “why” to your goal. Your why is simply the reason why you’re going to reach your goal. What are you working for that will make you never want to give up? My 2017 health and fitness goal? I will not only weigh my pre-pregnancy weight of 135lbs by December 31st, but get down to my happy weight of 124lbs. This sets short-term motivation while maintaining focus on your long-term vision. Too many people get caught up in how much weight you lose. Fat takes up a much greater amount of space than muscle. This means when you add one pound of muscle and lose one pound of fat, you are still going to weigh the same. However your appearance will be smaller. So please, please, pleeaaase do not get stuck up with the number on the scale! The scale is not necessarily the best way to measure your progress. Measure your body fat levels to get an idea of your body fat percentage. Take body part measurements each week to track inches lost. Take pictures at least once each month to really see your results. This doesn’t mean you should throw away your scale or anything, but just don’t think because you didn’t lose 5lbs in one week doesn’t mean what you’re doing is not working. 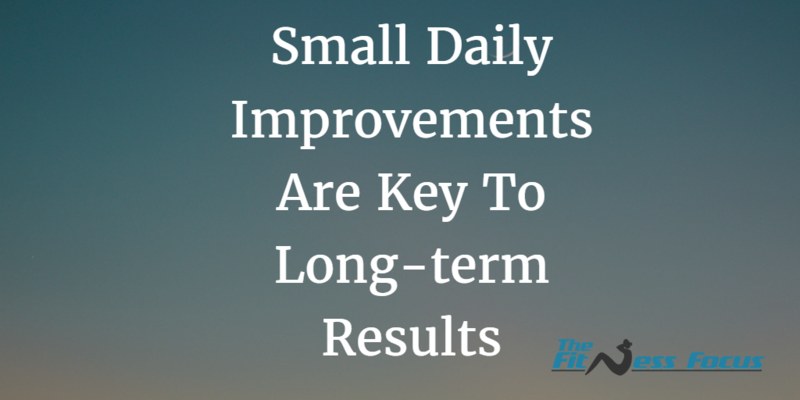 Instead, 1-2 lbs of weight loss each week is a very good number for people to focus on and set as a goal. More than this amount of weight lost in one week, and it’s much more likely you’re losing more than just fat tissue – not a good thing! The Struggle is Real.. Stay Consistent! There is not a big difference in people who fail and people who succeed. The difference I see? A group is more likely to stick with it, but an individual will have a much more difficult time going it alone. The key here is group. Humans are social creatures. We build communities to become tribes around different aspects and areas of our life. Remember the kids you hung out with throughout childhood? If you are on Facebook and want to join the ultimate in support and motivation groups, be sure to check out my monthly 30-day Beachbody program challenges. If you ever have a questions about the content on this site, please send me an email at bethany@thefitnessfocus.com.